Healing S.E.N.S.E. : What is Chiropractic? Chiropractic is a natural form of healthcare that relies on the body's own ability to heal. The care encourages the body to regain strength and heal itself. Chiropractic can be beneficial for the whole family. 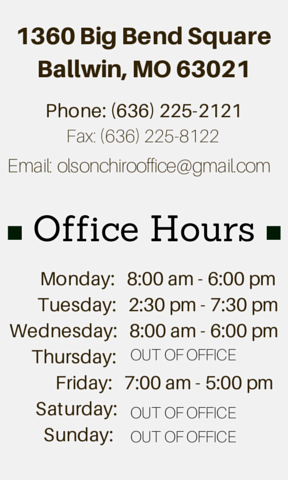 Dr. Olson has had great success in treating children and adults. It is a good idea to start chiropractic care for your children at an early age—the earlier they learn the concepts of wellness, the greater health they can experience. Chiropractic can be successful in treating common child illnesses such as: chronic ear infections, TMJ, scoliosis, allergies, colds, and flu. Chiropractic really is a family affair. As an adult, chiropractic can help with back pain, neck pain, allergies, cold and flu, and many other conditions. But remember that you don't have to wait until you or your child feel symptoms: Preventative and wellness care is the best way to fight illness. Chiropractic can help you and your family build natural resistance to help fight off attacks on the immune system, which in turn keeps you healthy. Medication isn't proving to be an answer for childhood illnesses. Try natural approaches with your children. Many infants and children need regular adjustments due to difficult births, frequent falls and accidents, and roughhousing. Chiropractic care has been shown to help children with ear, nose, and throat infections, asthma, anxiety, hyperactivity, poor concentration, and much more. Unlike antibiotics or other medications, chiropractic care can help a child overcome an illness and build their resistance to future illnesses. You take your children to frequent eye, teeth, and ear check-ups, so add a spinal checkup—it's just as important to their health. Make it a vital part of your children's healthcare. Chiropractic adjustments free the body of subluxations, allowing the brain and nerve system to function at peak capacity and maintain balance. With an increased efficiency in the nerve system, the body has extra energy left over to use in other ways. Chiropractic encourages the body to a greater resistance against disease. Even if you don't feel bad, it is wise to come in for regular adjustments to keep the body resistant to illness. You not only want to be relieved of your symptoms, but to experience health. Health is when you are in balance, and in this condition, you are most resistant to illness and disease. Chiropractic adjustments coupled with acupuncture promotes freedom of nerve flow in the spine by allowing all the body's nerves to send their messages, and balancing the body's energy. And chiropractic combined with acupuncture and Traditional Chinese Medicinal herbs is a very powerful medley for helping you reach your maximum level of health. Why Do I Need an Adjustment? An adjustment is a solution to a problem known as a subluxation. A subluxation is a term used by chiropractors that defies easy description; there are nearly 300 terms used to describe it. One common definition is a displaced vertebra causing pressure on nerves, which interferes with brain/body interaction. The subluxation leads to body malfunction or disease, which can result in lowered resistance to disease, pain, imbalance, fatigue, and can pave the way to illness. Subluxations are very common—nearly everyone has them—but often they are painless. And sometimes the pain associated with a subluxation is located far from where the subluxation occurs. Subluxations can be caused by accidents, falls, heavy lifting, or from more subtle wear like sitting improperly, favoring an arm or leg too much, looking down too long while reading. These have cumulative effects and cause the spinal bones to give. Emotional trauma like stress can cause tension and weakness in the muscles that support the spinal column, which allows subluxations to occur as well. Therefore, periodic spinal examinations to locate and correct the vertebral subluxation should be a part of every family's heath care routine. An adjustment is like a realignment of the spine. It is a correction of the subluxation. Adjustments can be helpful in eliminating sinus pressure, headaches, pains in the neck, back, and shoulder, and maintaining health. Adjustments keep the communication system open between your brain, nerves, and spinal cord. If this communication system is forced to reroute itself—or is being interrupted completely—subluxations occur, and disease will follow if the problem is not corrected. The body has the ability to heal itself if the communication system is functioning properly.